Lori and I are from the same hometown ... Latrobe, PA ... also home to the late Mr. Rogers and Arnold Palmer. Although my family moved from Latrobe when I was 12 years old, Lori and I were able to reconnect through mutual friends and Facebook. She is remarkably fit and incredibly driven in her pursuit of health and wellness. She is active in all aspects of the word and gives to her community through her occupation and volunteerism. I'm honored that Lori agreed to be interviewed. My name is Lori Coffman. I live in the Pocono Mountains area in a small town called Sciota, PA. I’m originally from Latrobe , PA. I live there with my 2 awesome sons, Ethan & Cole who are 13 & 11 respectively. I’ve been married to my husband Adam for 19 years. Currently, I work with the IDD population and am an Associate Director for LifePath, Inc., a non-profit in the Lehigh Valley that provides services to individuals with developmental disabilities. I help advocate and care for a large caseload of individuals who are the best teachers I could ever have on how to appreciate life day in and day out! I’ve been there 16 years. In addition, I am a Fitness Coach and Fitness Instructor through Beachbody and Beachbody Live as well as a Certified Nutritional Therapist through the Health and Sciences Academy. Helping people has always been at the center of who I am. My goal is to help anyone and everyone live happier, healthier, longer lives by focusing on the basics of nutrition, fitness, and wellness. Advocating for each individual I help to care for at LifePath has made me a better advocate for my children, family, clients, and self. I have also been a practicing martial artist for over 19 years and it has helped me to understand the path I’m on and how life is all about the journey. With its ups and downs, you must find joy in each struggle because each is an opportunity to learn. As it’s never too late to learn. I’m also going back to school for my MPS in the Psychology of Leadership. My passion for health and wellness started from an early age. I was diagnosed at the age of 16 months with an unspecified seizure disorder. As a child, my seizure disorder was much more prevalent, but it began to decrease in frequency throughout adolescence and adulthood. It has been over 6 years since my last seizure. As a young adult, I started experimenting with my nutrition intake and “listening to my body" ... how certain foods, beverages, etc. made me feel. Often times, as a younger adult, I realized that heat and escalated heart rate would lead towards seizure-like symptoms. When my core body temperature would be unable to be controlled, the propensity for me to have a seizure would increase. From a nutrition standpoint, I realized that breakfasts and meals too high in carbohydrates would lead me to shake. I proceeded to incorporate different sources of carbohydrates and lean proteins, and I increased the fresh fruits and vegetables in my diet as well as added a nutritionally-dense superfood called Shakeology to my “diet”. I minimized added sugars, white flours, refined and processed foods, and pulled back on dairy. Throughout the past 5 years, I’ve continued to modify my diet to reflect what helps FUEL me through my days. Truly, it is all about moderation and what works for your body. In 2013, I sustained a partial rupture of my Achilles Tendon while I was teaching a student during a martial arts class. The resulting surgery and subsequent recovery took an entire year. In 2014, during the last 3 months of my AT recovery, I decided to become a fitness coach, hoping that others who were seeing my injury and subsequent recovery would be inspired; that it would help them to step out of their comfort zone to improve their own health. In working with so many people and in seeing so many health issues with my family, friends, and loved ones, it became my mission to impact others’ lives in a positive way through helping them understand how important nutrition is and how it can FUEL you for day-to-day life. "Day-to-day is the Way" (my motto) is all about taking life in and capitalizing on the gifts you have every day. You only get each one once. Nutrition and fitness are the “back to basics building blocks” that you can control and help improve your health and life. I assist in teaching at Heritage Martial Arts, the dojo my family and I have been involved with for a number of years. I am a part of Dignity Committee at LifePath and lead committee meetings. I help organize and volunteer at events within the committee. At times, I lector at the church I attend. My biggest inspiration has been my family and the people I serve at LifePath. It is amazing to me the gifts that each of our consumers have and what lights they are to everyone around them. It’s almost as if they are “hidden gems”. If more people could see and understand through the eyes of each person that is served how good health is truly a blessing, they’d gain a whole new understanding for life and joy. My children inspire me to be better for them. Originally, I was told I would not be a mother due to my seizure disorder, and after miscarrying, my boys are the greatest gifts I will ever receive. It makes me tear up just writing this. I love to go hiking with my family. I love to travel and wish I could do it more. One thing I need to do more of and have been working on is self-care. My “me time” is so important. I live with three men and need girl time! I indulge in Perfectly Posh Masks, facial treatments, and body lotions. One of the other things I’ve been doing is using bath/body, skin, and cosmetics products that minimize or have no chemicals, added fragrances, parabens, sulfates, or petro products. Perfectly Posh is awesome because they are USA-made, utilize essential oils for their amazing scents, and are cruelty-free as well. That’s important to me. What goes on your body is just as important as what goes in your body. Oh, and every so often, I like a good cupcake! I love to bake, too! Have since I was a little girl. Day-to-Day is the Way -- Give it time, you’ll get there. 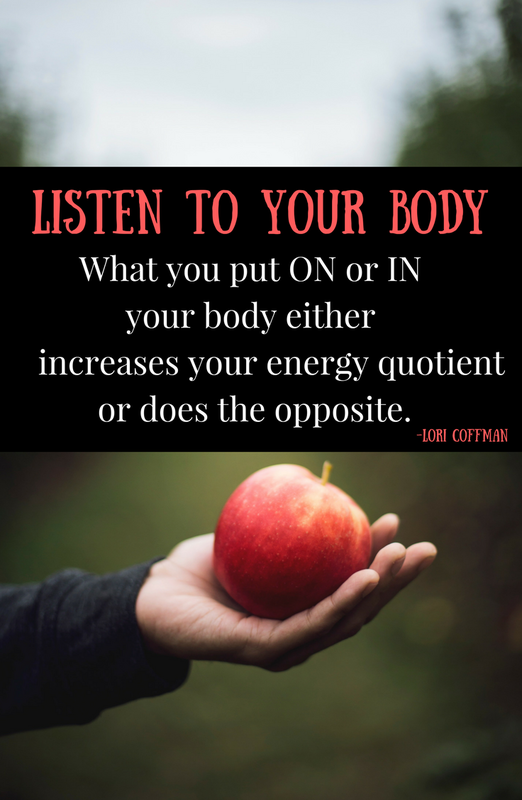 Listen to Your Body -- Get in touch with how what you put on or in your body either increases your energy quotient or does the opposite. Take Time for Me-Time -- Even if it’s 10-15 minutes of quiet time, reading, relaxing, whatever the case. Do it daily. Focus on the Positive -- Do some type of personal development every day. Read or listen to positive content; surround yourself with positive people. Give Thanks and State It Out Loud -- State 3 things you are thankful or grateful for every day. Realize what you have right in front of you. I hope you've enjoyed this interview with Lori. She's been through her share of struggles but has come out on the other end stronger, assured, and with an incredibly giving heart. Please take a moment to check out her social media pages. This girl is IN SHAPE and can rock a great yoga pose, too!